One of the best parts of summer is being able to enjoy your outdoor patio with family and friends. Breathing in the views and the fresh air, cooking on the barbeque and enjoying a meal or just relaxing with a good book are just some of the best parts of your backyard patio. As an extension of your home, your deck or patio acts as an extra space for entertainment and family activities, but there is no need to limit your time outdoors to just the summer months. 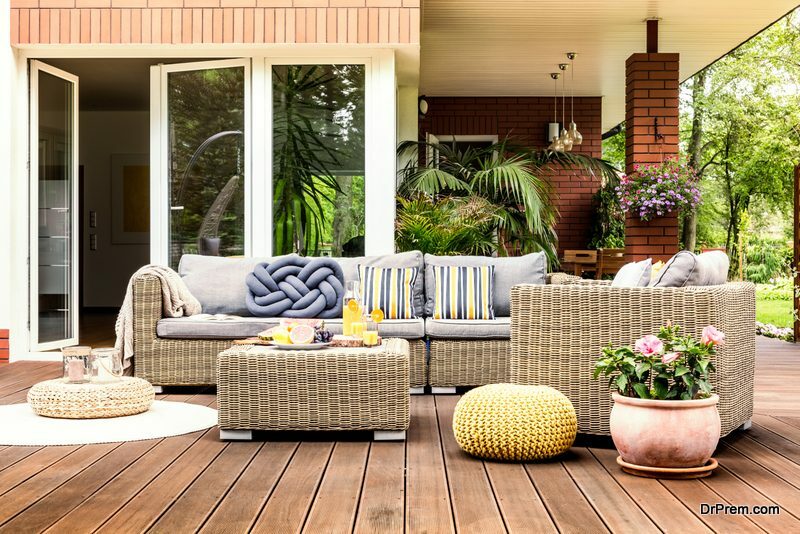 With a few thoughtful and inspirational ideas, there is no reason that your family and friends can’t use your outdoor space all year round. Whether you have a small garden patio or a large space designed by a professional deck builder, there are some simple ways to transform your backyard space into an all-season oasis. Protecting your patio from the elements is one of the most important aspects of an all-season leisure space. Shading from the hot sun, rain and even snow is the quickest way to entice you and your guests into the outdoors. Consider building a pergola with climbing vines for a lush feel; or, invest in a retractable awning to cover the space when needed. If your porch is smaller, you can even extend the roofline of your home to cover the area. Shade sails are also becoming a popular and modern-looking option to protect you and your family from the elements. 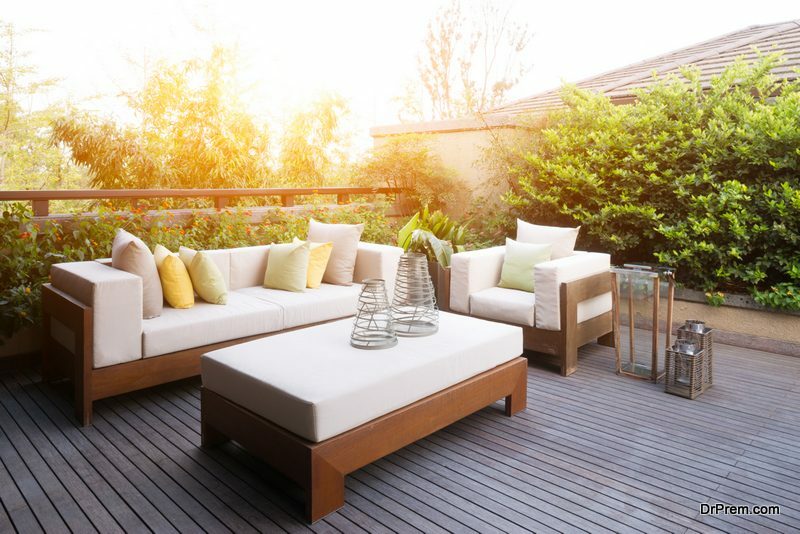 Your outdoor furniture should beckon guests to take a comfortable and cozy seat. Make sure to invest in quality furnishings for your patio that will last you for years. Most outdoor furniture is designed and built to withstand the weather and is often constructed from moisture-resistant materials and fabrics. Having a place to sit and relax, as well as a place to gather for a meal, gives you so many options for enjoying an outdoor lifestyle in comfort. Your outdoor space should feel like an oasis, which gives you privacy and serenity. Surround your patio with hedges and plants that provide you with some screening from your neighbors. This will help you achieve the illusion that you are looking for. Roll-down or bistro blinds can work well to give you a more enclosed feel. Gardens can be lush and beautiful in the summer months, but if you are looking to use your patio all year round, choose a variety of plants, bushes and trees that will keep your patio landscape looking attractive in every season. Having a variety of lighting options on your patio can allow you to choose the mood that you want at any time. Overhead lighting, candles, lanterns and strings of fairy lights can add a romantic and relaxing feel to your patio. Strategically placed garden lights around the perimeter of your space can also lend a lovely effect. In most cases, it is the colder weather that keeps people indoors and off the patio. Bringing in a fireplace or fire pit can not only add warmth and comfort to your space but also act as a cooking utility. Propane heating towers are also a great way to heat the outdoors to keep you and your guests comfortable in the winter months.